A chef and a builder spent six years converting this barn into a home and luxury B&B with cookery school. Now they’re sharing it with us. Sharon Dale reports. When Caroline and Andrew Whalley bought an enormous, tumbledown barn with its own lake in the Richmondshire countryside, they didn’t intend to make it their home. The sensational, open-plan layout is in keeping with the architectural history of the barn. “We thought we would convert it and sell it. We didn’t expect to fall in love with it,” says Caroline. The idyllic rural location, plenty of land for horses and the barn’s potential were all part of its allure. But it soon became clear that it could be the perfect live-work home, where they could marry their skills. Caroline is a professional chef and Andrew is a builder and wine connoisseur, who can turn his hand to anything practical. So the obvious plan was to make a luxury B&B with space to hold cookery classes. “The idea came to us about 18 months into the project. I was working in catering and Andrew was busy clearing out the lake and doing the landscaping before starting the conversion. “We got very attached to the barn and realised it could be our home if we could make it pay,” says Caroline. The couple have a wealth of experience in the hospitality industry, starting with their own wine bar and restaurant in Tunbridge Wells in the early 1990s, which is where Caroline discovered her talent for cooking. “We were living in Tunbridge Wells and realised it needed a wine bar. I was 21 at the time and very gung-ho and Andrew specialised in converting barns so we bought an old building and refurbished it ourselves. The barn was converted by Andrew, a self-confessed perfectionist. They sold the wine bar 16 years ago to head back to Yorkshire, where they have family, and opened a restaurant in Leyburn. It went well until the foot and mouth epidemic devastated the area. After heading south again to work, they came back north. “We always wanted to come back to Yorkshire as I was brought up here and we love it. 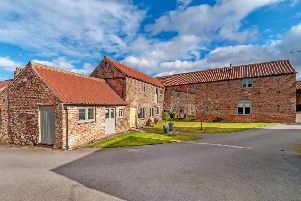 Andrew specialises in barn conversions so we were looking for one to develop and found this. It was further out of our search area, too big and on its last legs but in a gorgeous spot and really convenient for the A1,” says Caroline. The conversion and landscaping took almost six years and for much of that time the couple lived in a portable building on site. The sitting area with a fireplace designed and built by Andrew, It features a raised hearth that doubles as a seat right next to the stove. The first job, after they decided to keep the property, which is in Aldbrough St John, was to build a stable, a yard and arena so Caroline could get her horses out of livery. Andrew then turned his attention to the property. Its perilous state was highlighted when one wall collapsed under the weight of snowfall, though their luck improved when they sank a borehole and hit a natural spring – so they now have their own spring water on tap. Taking his time to do things right has paid off for Andrew, who retained and restored the character of the original building, which he “virtually rebuilt”. The quality of the finish inside and out is exceptional and reflect his attention to even the tiniest detail. New but reclaimed beams and trusses have been left exposed and there are large areas of glazing, which bring in natural light and the sensational views. The internal layout first planned was reconfigured to suit the barn’s multi-functional purpose as a home, a B&B and a cookery school. At its heart is an open-plan kitchen dining area leading to a sitting area with a huge brick fireplace that looks as though it has been there forever. It was designed and built by Andrew, who cleverly incorporated a raised hearth big enough to sit on. The kitchen was designed by Ian Oakley with Shaker-style units from PWS in Newton Aycliffe. It is enormous and created to suit Caroline’s needs. There is a walk-in pantry for all her ingredients and gadgets and a gigantic island where her cookery students can gather round. There’s also a bar, which is Andrew’s domain. She offers breakfast with everything from a full Yorkshire to home-baked bread and blueberry pancakes, along with three-course dinners, part of the reason for the success of their venture, Hollymoor House. The four guest bedroom suites are at the far side of the barn and overlook the lake, while the Whalleys’ accommodation is on the other side. The backdrop is neutral with colour from curtains and soft furnishings made by Gill Wilkinson and bed linen from White Company. The furniture is a mix of inherited pieces and new buys from local companies like Dovetail in Bedale and Simply Dutch in Leeming Bar. The beautiful dresser donated by Andrew’s mother is a talking point along with the couple’s collection of Portmeirion crockery. “The Portmeirion was a wedding present and it had been packed away for 14 years so it felt wonderful to get it out and use it again,” says Caroline.